------It's a life many of us fantasize living -- keeper of a light. Alone, or with only your family, for perhaps weeks at a time. Far from the hub-bub and business of city life. A life in tune with nature's moods. Times of quiet beauty and tranquility -- alone with time and the sea. The lonelyy cry of a gull, the constant roar of the ocean swells against the rocks. Of course, the times to remember distinctly -- the storm that crashes waves against thhe kitchen window, forty feet above the sea -- and that blasts seaweed out of the toilet with the force of tons of waves crushing down on the sewer pipe. And times when nature's call sends a cougar to your small island, seen crouching under the boardwalk to the lighthouse -- and later peering into your kitchen through the window. A cougar that weighs so much two strong men were unable to lift its inert body. 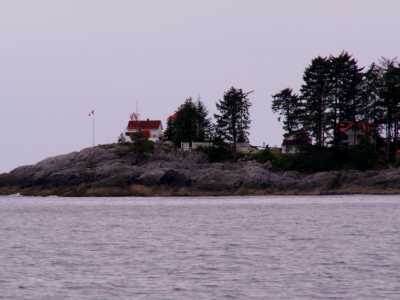 ------There are lighthouses all along the Inside Passage to the north to guide and protect shipping. Most are on the 'outside,' guarding the outer coast for larger vessels transiting the ocean. The keeper of the Ivory Island light, Brent, is interested in owning a C-Dory. We have exchanged emails about a possible visit on our route north. There were the usual caveats about weather (lighthouses aren't perched on rocks in calm seas) and difficulty of landing without a jetty or dock, but we thought we would at least have a chance to visit on the VHF lighthouse frequency as we passed Ivory Island. 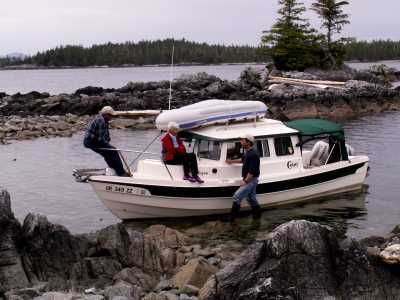 ------We had just fueled in Shearwater and were en route to an evening anchorage nearby. Fortune smiled -- the 1600 hour weather forecast called for light winds and combined swell and wind waves of less than one meter at the Ivory Island light. It was late in the day but the forecast for the next day was for winds 25-35 and seas of three meters so we decided to head to the light. A radio call to the light on the 'keepers channel' of 82Alpha raised an answer from Sylvia. She was tending the light so switched us over to her husband, Brent. "Sure, I'll meet you on the lee of the island, near the old boathouse -- there's a fish net strung across the bight but we can talk on radio and wave. It will be a few minutes since it's a half mile walk." 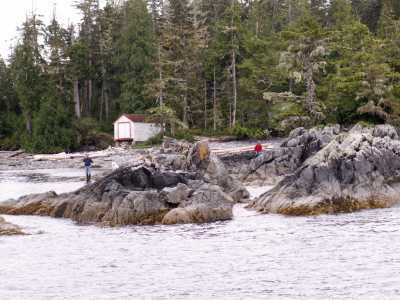 ------It took us more than a few minutes to thread the rocks on the lee of the island. 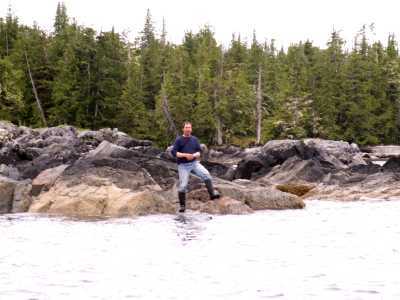 When we approached, Brent called on VHF, "If you can make it around the end of that long fish net you might be able to get on the inside and perhaps I can hold you off the rocks and we can have a chat." ------"We'll give it a try," we radioed back. ------The rocks were jagged and torn -- only the toughest rocks can resist the power of the ocean and remain as an island to challenge the sea. 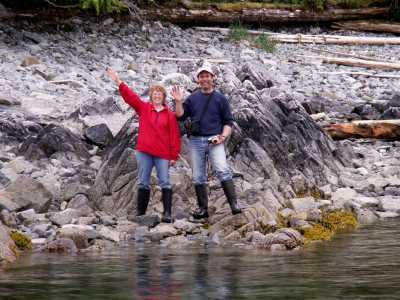 We threaded a route toward the rock shore following hand signals from Brent. Syvia's Siren Smile - And we thought Keepers were to keep sailors off the rocks! ------Brent caught the bow and we had a long chat on the shore. Brent comes from a long line of boat people, dating from the days of steamships. 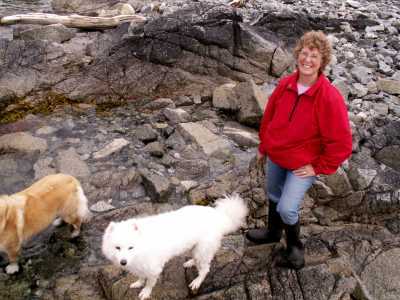 Sylvia was a stock broker and the day after our arrival she was to take charge as Head Keeper of the Ivory Island light! Brent had accepted a position as Keeper on the Estevan Light, a lonely outpost serviced only by helicopter on the windswept ocean side of Vancouver Island. They will be apart for months at a time, but that is the job of a Keeper. 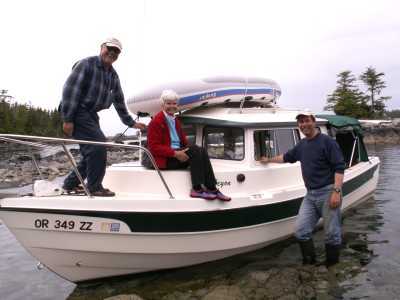 ------While Sylvia climbed aboard to explore Halcyon, we heard tales of the keeper's life from Brent -- tales of storms, cougars, and long hours. Today life is more civilized than when they began their jobs. Now they have satellite television, and internet and email contact with family and friends. Why they even have an 'an emergency packet' supplied by the Province to support them should there be an earthquake. A Friendly Wave Bon Voyage from the Light Keepers!